The Free Day Quiz has returned! Browse through all of the questions that were available during the chaos and test your knowledge. If the Free Day Announcement was the beginning and the Free Day Event the exalted sequel, then today marks the completion of the trilogy! Okay, so it's not that epic. But the quiz is back. Check it out! The questions look just as they did before but without all that pesky Free Day logic. Flip through them one by one if you like and save your answers. In total there are 63 questions covering 17 different bite sized tutorials. Perhaps more will be added in the future, provided we can pry an engineer away from his or her toys for a while. Enjoy! Now, this isn't a complaint ( I couldn't possibly.. ), but a suggestion of fairness. Some questions just take longer to answer. If the quiz is ever done again(PLEASE PLEASE :D ), I suggest maybe giving the questions a time-ranking, and giving everyone some quick Q's off the bat, which get longer to solve as it progresses. This will give less seasoned electro-geeks a better chance at hitting Q.2 before the bell rings. I just wouldn't want to be a newcomer trying to convert hex>dec and being to slow for Q1 after reading a bunch of tuts and being able to score a few otherwise. The ones who can answer them all quick enough are likely to be loyal deserving customers anyway. we counted about the last 20 sec of new years. I spent about an hour watching it go down... i got through 4. i admit i was one of the newbies (i got stuck at q. 3) but persevered :) post christmas presents!! The question about battery charge time should say "in theory" or "Under ideal conditions" because inefficiencies would most likely extend the charge time a little. Other then that, i got them all pretty much right except for a few of the number format conversions. I had a lot of fun answering these. glad to know I got a few right. I was hoping something like this would be added after Free Day! Re. Static Electricity: The primary reason we don't die from static, as I understand it, is that the body's capacitance is tiny. About 100pF or so. There's no limitation anywhere causing the current or power to be low, since humans are primarily a capacitive source. The current and power are huge, but only for a fraction of a second, and only a tiny amount of energy can be dissipated (since only a tiny amount was stored). Also, what does "total power" mean? Average, peak, integral .dT? I'm sure that the answer to "Charging Billy's Battery" is not 10 hours. If that were true, it'd be 100% efficient. As well as that, only really crap chargers (which you don't want) are constant current all the way. Better ones use constant voltage at the end, when cell voltage is at the maximum acceptable level (normally 4.2V). 11 hours is the closest answer, but I'd say 12 or more to be sure. The question does not state the configuration of the circuit or (critically) the voltage of the battery. My solution would require a ~20V Li-Ion battery, not at all uncommon for laptops. 18mA for all 9 LEDs plus the chip wouldn't make sense, though, unless he only ever wanted an off-white color from those RGB LEDs. On the other hand, it is referring to an actual product - the LectroCandle - so we could check out its sheet to figure out the circuit configuration. The problem description did mention it was powered by a lithium-polymer battery. Still, not if it were multiple cells in series. It didn't say anything about voltage, but I guess implies 3.something volt. I agree, the other questions in this set were pretty clear with the emphasis on theoretical charge/discharge time. This one didn't emphasize 'theoretical' so I went for 11 hours as well. I guess that is why it was multiple choice. It was not intended to be an Electrical Engineering Final Exam - just something to make you think. i did well on most of the quiz except for the pull up resistor and numbers part. I've never needed to use binary so I'm kinda wondering why it was included? oh and keep doing free day! Than you are realy good with HEX or ony using arduino's? Well, first of all, If I would learn to read carefully, I would have missed one less. You don't need to pry me away from my toys to get questions from me! I'll give you your toys back if you come back to IRC! It's okay, I'm an engineer, I'll make some more toys! I just sent a link to two of my uni lecturers with the first years in mind! He agreed that it was a great quiz and asked if there was any possibility for firmware (C specifically) questions to be added! I do feel that this is very hardware oriented... and hardware is (generally) just a pile of tin if it wasn't for the firmware! If they put questions on firmware they should do it for Assembly, as it's the real language of the micro. okay okay... ill take that back! fpgas also often also have a processing core within - NIOS for example! How about FPGA's, VHDL is no firmware :-P, but almost everything is possible. I serviced electronic devices for an Office Supply company in the late 1970's. ALL calculators at that time were strictly SSI chips (plus resistors, diodes, and transistors) - the 'firmware' WAS the electronics. Good quiz, btw. In the "Resistor connectivity" question about the mosfet transistor, what do you call "keep the mosfet in a known low state" ? For me that means the state where it's output (drain) is low (led is on). In this case, the state is impossible to achieve with this circuit if the 3.3V is out. Since the answer you expected was "R1", the question could have been "Which resistor should you connect to the gate pin in order to keep the mosfet GATE in a known low state" or "Which resistor should you connect to the gate pin in order to keep the LED off"
During the real "free day", the server was so slow I could not get a single page to load (except the error message), then it suddenly started working at near normal speed, but I only had time to answer 3 questions before the whole thing was over. Thank you Sparkfun for the 30$ gift ! DOH! I would have easily maxed out Free Day if I could have gotten through more than 2 question! Moar servrz, plz. K? But the Melt-O-Tronic is ecstatic about melting his new acquisitions. It was non-ideal server conditions that made free day ideal for some of its participants, and exciting for most of them. It almost seems like next year's free day (assuming there is one) would need to include some sort of random selection process to keep things rewarding for participants. This year, you could have just given everyone $5-10 instead, and it would not have been nearly as exciting. That is to say, the prospect of getting a lot of money is what makes free day attractive, not just to the total amount given away by SFE. Is free day sustainable given rising participation, high expectations and non-infinite funds? 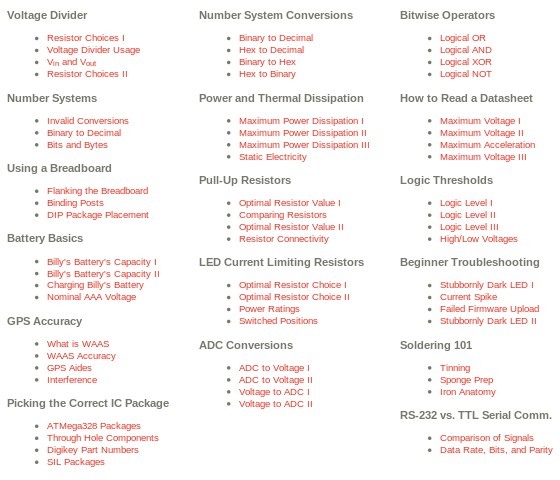 Which of the following statements on the differences between RS-232 and TTL is not true? Not, An RS-232 signal requires two stop bits while a TTL signal only uses one. Please correct me if I'm wrong but I remember spending a afternoon in lab debugging a project before I learned that rs232 is inverted. EDIT: Nevermind, inverted logic got me again! I should learn how to read. i need to L2R.. whats the BINARY representitive of 0xA2 uhm.. 162? I almost messed up on the first question- first thought was correct, but then I started to overthink it, knowing how sneaky these sparkfun guys are. Load current, anyone? Fun little quiz for beginners and even just as a reminder for us tinkerers! I already messed up the RS232 "not" question.. I rarely deal with those. 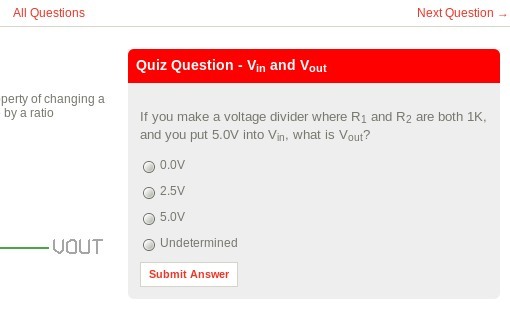 I do think at least one of the questions might need a little nudge, though: "Quiz Question - Nominal AAA Voltage". Although the correct answer should be obvious, it's a bit misleading to speak of a nominal AAA Voltage; AAA being a form factor, rather than a Voltage standard. It'd be great if there was a score. *edit: There's now a basic stats box on the quiz index page. I might flesh it out a bit more in the next couple days. 40: Logic Level I. Silly misreading of the question. 58: Comparison of Signals. Haven't touched RS232 in ages.